Tesco is six months away from completing a three-year programme to deliver a single datacentre operation to support UK and international operations. Tomas Kadlec, Tesco's group infrastructure IT director, has spent the last year consolidating the European and Asian IT operations. In the last two years the retail giant has expanded its online business across eight countries. He said: "We have consolidated the basic functions together." This has involved building a platform which can be rolled out to the countries where the website runs. The website roll-outs are part of a wider datacentre simplification and consolidation programme that Tesco has been running following its global expansion programme. 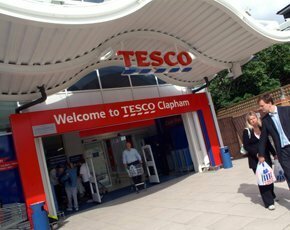 Under the IT strategy of former CIO, Philip Clarke, who is now the retailer’s CEO, Tesco created pre-built infrastructure and services, dubbed "Tesco in a box", which could be deployed quickly into new regions. Kadlec is not seeing a major push for IaaS (infrastructure as a service). He said: "A cloud service works great for x86 platforms, but it is difficult to migrate your whole suite of systems into the cloud. There are not too many people who are selling cloud mainframes or cloud-based OpenVMS [platforms]." Kadlec believes IT departments can see many of the benefits of cloud computing by running the datacentre efficiently. Tesco is, however, looking closely at platform as a service - the company already uses Microsoft Azure and Office 365. One of his successes has been deploying SharePoint: "We have been trying to implement SharePoint for many years but it never took off because it was driven as an IT project." But when Tesco moved to SharePoint in the cloud, the roll-out went viral, said Kadlec. Rather than IT learning to install the product, the team makes the tool available to the business and evangelises the benefits. "It is difficult to find a home in the business for a product [use] that doesn't yet exist," he said. Instead of focusing on implementing SharePoint, he said IT focused on making people excited about it. However, while conceptually elegant, the strategy posed problems for IT. Kadlec said: "There was a [project] lifecycle where you started with the infrastructure, then installed the application and customise it to local needs." This was achieved sequentially, on a country by country basis. So the only way to do more countries was to send out more teams. “Even though [our] intention was to make it all the same it ended different [in each country] either due to time constraints or the teams worked differently or the requirements were different." This created a form of IT sprawl which the retailer is now addressing by delivering IT for Tesco from a central UK datacentre. Over the last five years, Tesco has been tackling the variations across countries by bringing the teams and infrastructure together, Kadlec said. This allows Tesco to develop the IT systems once, and then deploy them across different regions. Kadlec has a roadmap to consolidate the 35 datacentres around the globe in a bid to run Tesco IT centrally out of the UK, rather like a global shared service centre. Whatever new applications are deployed, they are now being installed centrally. This occurred with the international online business. He said: "I was doing the integration of the infrastructure between the retail team in the UK and the online grocery team and bringing the two datacentres together because online had its own datacentre. We built the new infrastructure, which is now being used to deliver the websites for China and Eastern Europe, all from a facility in the UK." This approach is being used to consolidate other Tesco systems. “We take them to a certain level of maturity and then offer them to other countries," he said. Building datacentre capacity in the UK to support Tesco globally has involved a programme of work to ensure there is enough space within its facilities. "We started to clean up the datacentre in order to [prepare for] the expansion," said Kadlec. Today Tesco operates two strategic datacentres in the UK along with space it rents for future growth complemented by a cloud strategy. Historically Tesco used CA software to manage its mainframe systems. The firm had a few attempts to use CA tools for systems monitoring in its datacentres, but Kadlec admitted: "Given how we implemented monitoring, we spent more time implementing than actually using. In the last three years we shifted from trying to be the experts at installing the monitoring products to becoming experts at using them." It was quite a painful shift, he said: "We thought we knew better than CA on how to do monitoring. As a consequence we didn't listen and didn't allow CA to implement the tools." Two years ago Tesco wanted all the IT systems involved in retail to be managed from one place. This is now possible, thanks to running integrated systems monitoring tools from CA. And the same monitoring tools are now being used to support the online business. "This year my plan is to roll out [system monitoring] across all our European and Asian operations," said Kadlec. When complete, in around seven months’ time, he said: "We will be able to increase the benefit and maturity of [IT operations]." Earlier in November Tesco received the CA Expo 2013 award for impact for its implementation of this single system monitoring framework. The framework enables operations staff, infrastructure management teams, service managers and application owners to have different views of the running IT system. When Kadlec started in the UK business, the focus for IT was on centralising, consolidation and converging IT infrastructure. This is still a key focus, but it is part of normal IT operations. The challenge for IT now is: "How to ensure whatever you deploy is always current; it is available and there is enough of it," he said. IT operations is changing. DevOps is one of the buzzwords doing the rounds. It encompasses an approach to IT operations to support ongoing software development. Kadlec said: "The days of building bespoke datacentre components for IT projects is long gone. You now have to pre-build the platform in the datacentre or in the cloud and modify the applications to use these pre-built components."